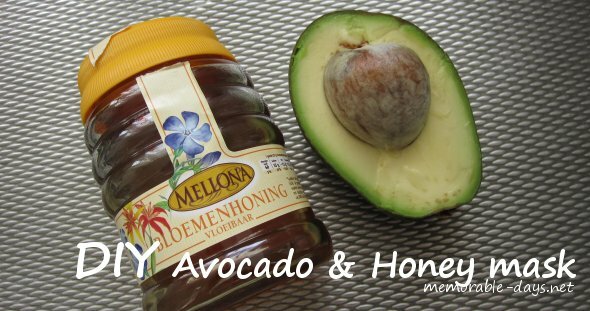 DIY Avocado & Honey Hydrating Mask | Memorable Days : Beauty Blog - Korean Beauty, European, American Product Reviews. 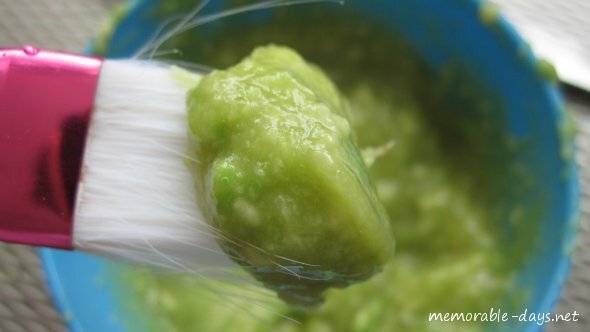 Yesterday I tried a DIY avocado face mask. As y'll know avocados are great for you. They are super rich in vitamins and minerals, especially Vitamins A and K which will brighten the skin. This mask also should be moisturizing & nourishing, which is suitable for people with a normal to dry skin. Since I have a combination dry skin I wanted to try it out and see if it's really that good. Homemade masks are usually inexpensive and everybody can make it because it's easy as well ^___^. 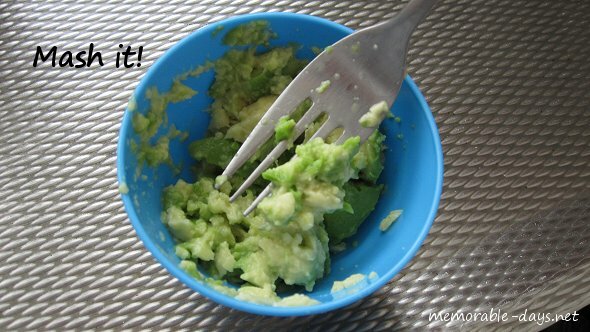 Step 2: Put the 1/4 avocado into a bowl and mash the avocado with a fork or put it in the mixer. Step 3: Add 2 teaspoon of runny honey and keep mashing the avocado. Step 4: Apply the mask with your brush. Spread a thick coat of the mask on your face and leave it on for at least 15 minutes. Rinse with warm water and a washcloth. Well, did this mask really work for my skin? To be honest, I didn't like this mask at all. It did feel fresh at the beginning and it did make my skin soft afterwards but NOT moisturizing. After I washed it away with warm water it not only felt dry, it was itchy as well! I think that I'm allergic to something somehow o__O'. It was quite weird, because I'm not allergic to anything normally. This is the first time that I tried an avocado mask and my skin didn't feel good at all. Thankfully, I didn't get a break out from it though. My sis had also tried this DIY mask before but it felt moisturizing and soft on her skin =/. Hmmm... have you girls tried this homemade mask before? Oei klinkt dus niet goed! Denk niet dat ik dit dan ga uitproberen haha. Ik heb zelf nog nooit echt een masker gemaakt, maar het staat wel in mijn planning! @Robin, hahahah.. normaal eten vind ik het zelf ook minder, maar als het in een salade zit, vind ik 't wel weer lekker xD..
OOO, I need to try this when summer comes around. I don't have time to make anything since I'm not done with school yet. whoa i like eating avocado!! !nice DIY mask! Zo vreemd dat je huid begon te jeuken, ook al ben je niet allergisch. :S Had je eerder al problemen met advocado of honing op je huid? @bibi, ben blij dat honing wel goed werkt voor jouw huidje ^^. Bij mij zorgt het ervoor dat het droog wordt, omdat ik een vrij droge huid heb (ik heb een combi droog huid). Het is erg vreemd ja, k denk eerlijk gezegt niet dat het aan de honing lag, maar aan de avocado o__O", omdat k wel eerder honingmaskers had gebruikt, maar nog nooit avocado. @Joey, more dry? wow, normally the people who tried it will notice the effect immediately. It's probably because of the honey that makes your skin more dry =/. i would stop if i were you >.<"
ive actually never used a mask before...but i love DIY beauty solutions ^^ will try on day. also did u know u can make honey lipbalm? heres a recipe ^^http://www.sevafrica.com/modules/fashion/article.php?newsid=128 i made it once but i didnt boil,nothing bad happened to my lips though ^^ thanks for sharing! @Rinny, hmmm.. that's probably the reason why i'm getting itchy feelings.. but i don't have any allergic reactions after i ate it =/.. so weird.. but thanks for letting me know..
@hihihi, i haven't made a lip balm before =), only a diy lip scrub.. i will try it out when i have the time ^^ thanks for sharing!